This package includes the Enhanced Pearson eText. 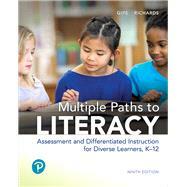 Multiple Paths to Literacy: Assessment and Differentiated Instruction for Diverse Learners, K-12 presents an analytical approach–consistent with Response to Intervention (RTI)–with practical strategies for recognizing students’ literacy strengths and needs, planning and differentiating instruction, and meeting standards. The strategies and techniques presented are appropriate to, or easily modified for, any grade level from primary through secondary school. Throughout, teachers are encouraged to take into account each learner’s talents with the goal of tailoring instruction to meet their needs. The 9th Edition includes a new chapter that shows how the arts can support the literacy development of all learners, spotlight features on students with special needs, new sections of disciplinary literacy and neurological disorders, and more. Joan P. Gipe is Research Professor Emeritus from the University of New Orleans and Lecturer Emeritus from California State University, Sacramento. She is currently engaged in online mentoring for Walden University’s EdD program. After graduating from the University of Kentucky with a BA and an MA in education, and Purdue University with a PhD emphasizing reading education, Joan spent many years working with learners of all ages: in Kentucky as a reading specialist, in Indiana as a fifth-grade teacher, and in several university contexts as faculty, supervisor of student teachers, department chairperson, coordinator for teaching enhancement, university/school liaison for professional development schools, coordinator of eld-based teacher education cohorts, and now mentor for numerous doctoral students engaged in research toward the Ed.D. Many publications, including this text, share with the professional community what was learned during this career. Joan now resides in the charming town of Healdsburg, California, nestled in the heart of Sonoma County’s Wine Country. She savors life there with her husband and her four-legged companion, Cocoa, a field spaniel, who earned an Honorable Mention in Sonoma County’s Best in Show. Janet C. Richards received a BS degree in K-8 Teaching from New Jersey City University, an MA from Tulane University in Guidance and Counseling, and a PhD in Curriculum and Instruction with an emphasis in Literacy from the University of New Orleans. She taught grades K-6 in New Jersey, New York, North Carolina, New Orleans, and the Republic of Panama. She is a Professor of Literacy at the University of South Florida, Tampa, where she teaches doctoral courses in writing and transdisciplinary texts, teaching, and research. She is also an affiliate faculty member in the Department of Educational Measurement at USF where she teaches PhD introductory and advanced qualitative research courses, Art-Based Research, and Writing as Inquiry. She serves as chair or methodologist on numerous PhD committees annually. She was selected as a Volunteer Literacy Scholar for the International Literacy Association’s “Reading and Writing for Critical Thinking” project in which she worked with teachers and higher education faculty in developing nations, such as Azerbaijan, Estonia, Romania, and Hungary, and with indigenous Myanmar political refugees in jungle camps between Myanmar and Thailand. She serves as senior editor of Literacy Practice and Research, received the Organization of Literacy Teacher Educators’ 2016 Award for Scholarly Research, and was chosen as the Lansdowne Invited Visiting Scholar at the University of Victoria, BC, Canada. She is the author of numerous scholarly manuscripts. This volume is her 13th textbook. She lives in Tampa, Florida, with her husband, brilliant little rescue dog, Jezzy, and two clever rescue cats. She is the proud mother of David and Matthew; mother-in-law of Allison and Missy; grandmother of Elizabeth, Madeline, Noah, and Joshua; and great grandmother of Jacob.